Guinea pigs obviously don't speak human language but that doesn't mean they don't communicate. By using sounds and postures guinea pigs can actually say a lot. Though you may not understand all the noises they sometimes make, there are things they do that have a fairly clear meaning and that can help you understand your guinea pigs. Guinea pigs make a variety of sounds or vocalizations, some of which most owners will recognize. Contented guinea pigs just going about their day often make a variety of squeaks, chortles, and quiet grunts that also seem to accompany casual interactions. Along with these frequent squeaks and chortles, there are a variety of other quite distinctive noises you might hear from your guinea pig. Learn to recognize these! Wheeking: This is a distinctive (and common) vocalization made by guinea pigs and it is most often used to communicate anticipation or excitement, particularly about being fed. It sounds like a long and loud squeal or whistle and sometimes wheeking may simply serve as a call for attention. Many guinea pigs will make a very loud wheeking noise in anticipation of getting some tasty treats when their owners open the fridge or get out the food container. Purring: Purrs have different meanings, depending on the pitch of the sound and the accompanying body language. Guinea pigs that feel contented and comfortable will make a deep purring sound, accompanied by a relaxed, calm posture. However, if the purr is higher pitched, especially towards the end of the purr, this is more likely a sound of annoyance. In fact, a guinea pig making this noise will be tense and may seem to even vibrate. A short purr, sometimes described as a "durr," may indicate fear or uncertainty, usually accompanied by the guinea pig remaining motionless. Rumbling: A guinea pig rumble is deeper than a purring noise. It is made when a male romances a female and sometimes females in season also make it. Often accompanied by a sort of "mating dance," rumbling is also sometimes called "motorboating" or "rumble strutting". Teeth Chattering: This is an aggressive vocalization that is a sign of an agitated or angry guinea pig. 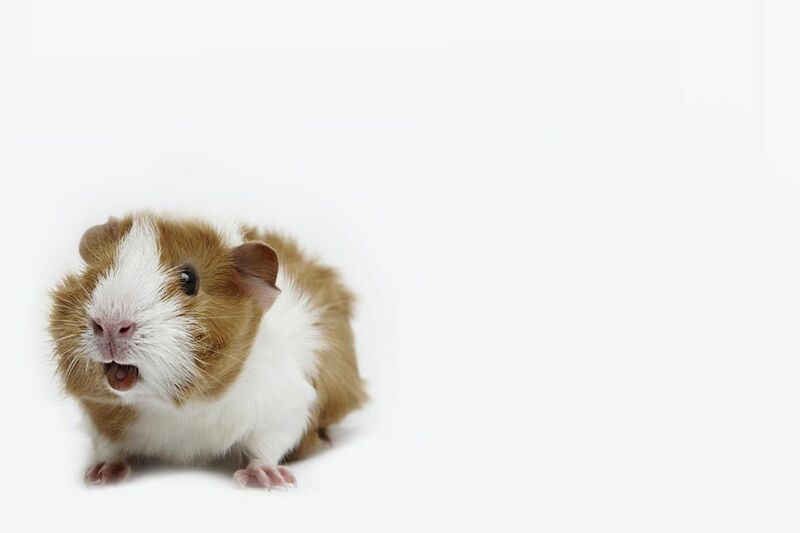 Teeth chattering is often accompanied by the guinea pig showing its teeth, which looks like a yawn, and it means "back off" or "stay away." Hissing: Like teeth chattering, this is a sign of a guinea pig who's upset. It is just like the hissing noise that a cat makes. Cooing: Cooing communicates reassurance in guinea pigs. It is a sound most often, but not exclusively, made by mother guinea pigs to their young. Shrieking: A piercing, high-pitched squeak called a shriek is a fairly unmistakable call of alarm, fear, or pain from a guinea pig. If you hear this sound, it would be good to check on your guinea pigs to make sure everything is OK and none of them is hurt. Whining: A whining or moaning type of squeak can communicate annoyance or dislike for something you or another guinea pig is doing. Chirping: This sounds just like a bird chirping and is perhaps the least understood (or heard) noise that guinea pigs make. A chirping guinea pig may also appear to be in a trancelike state. The meaning of this "song" is the subject of much discussion, with no firm conclusions. Popcorning: Easy to recognize, popcorning consists of hopping straight up in the air, sometimes repeatedly, just like popcorn does while it is popping. It is most often seen in young guinea pigs who are especially happy, excited, or just feeling playful. Older pigs also popcorn, though they usually don't jump as high as younger pigs. Freezing: A guinea pig that is startled or uncertain about something in its environment will stand motionless. Sniffing: Sniffing is a way to check out what is going on around them and to get to know others. Guinea pigs particularly like to sniff each other around the nose, chin, ears, and back end. Touching Noses: This is a friendly greeting between guinea pigs. Aggressive Actions: These can include raising their heads and/or rising up on their hind ends with stiff legs, shuffling side to side on stiff legs, fluffing out their fur, and showing their teeth (yawning). These actions are often accompanied by hissing and/or teeth chattering. If your guinea pigs do this with each other, be on high alert for fighting. Strutting: Moving side to side on stiff legs can be a sign of aggression, often accompanied by teeth chattering. Strutting around another guinea pig while rumbling is a typical mating dance and the origin of the term "rumble strutting." Scent Marking: Guinea pigs will rub their chins, cheeks, and hind ends on items they wish to mark as theirs. They may also urinate on things or other guinea pigs to show their dominance. Mounting: This can be either sexual behavior (males to females) or behavior used to show dominance within the guinea pig herd's social structure, especially between females. Fidgeting While Being Held: This can often be a sign that your guinea pig needs to go to the bathroom or that your guinea pig is just tired of being held. Either way, try returning your guinea pig to its cage for a bit. Tossing Head in the Air: A guinea pig getting annoyed with being petted will toss its head back as a way of asking you to stop. Licking: Most owners consider this a sign of guinea pig affection, though it is possible that they just like the taste of the salt on your skin. Running Away From Being Picked Up: Guinea pigs tend to be timid, especially at first. Running away from you is not a rejection but rather a natural defense mechanism. Given time and patience, almost all guinea pigs will come to accept being picked up for cuddles and playtime outside of the cage.